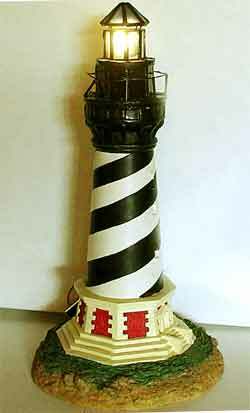 Add this great lighthouse light to your light house model or collectible. The light starts off slowly brightening to full on, then slowly dimming to off. Then the pattern repeats. or directly on your doll house or model train transformer or outdoor landscape lighting system or hobby transformer. Up thru 18 volts. The fully assembled beacon circuit comes with your choice of LED. Choose from warm white or cool white, or red. OR put multiple LEDs on the same circuit Contact us for options! Steve has 4 warm white LEDs on the one circuit for his larger scale outdoor model. With 135ft of buried electrical cable out to the light. Filmed in daylight, the lights are still nice and bright!